Levy O, Iyer S, Atoun E, Noel P, Hous n, Narvani A: Prooionibacterium acnes: an underestimated etiology in the pathogenesis of osteoarthritis? : Journal of Shoulder and Elbow Surgery 2012, 1-7. N. Hous,A. Narvani, R. Abraham, J. Relwani, T. Even, S. Copeland, O.Levy Stemless- Metaphseal Reversed Prostesis for Arthroplasty with Severe Cuff Deficiency: 2-4 years Results. Journal of Biomechanics, volume 43, June 2010. N. Hous, A. Levanon, B. Weller, U. Naveh, M. Halak, S. Fajer, R. karmeli. Is dizziness an indication for carotid duplex scanning. Cerebrovasc dis 2001; 11( suppl 3): 1-47 (abst). Krausz M, Michaelson M, Israelit SH, Bahouth H, Lerner A, Hous N, Stahl S, Paled M, Hoffman A, Ben Moshe Y, Eldor L, Faber D, Barzely M, Netzer A, Zaaroor M, Miller B, Ziser A, Barlavie Y. Harefuah. 2007 May;146(5):322-4. Hebrew. seminar on the treatment of casualties of the Lebanon war 2006 at the Rambam Medical Center. Hous N. Peskin B. Norman D. Zinman C. The second Lebanon war – statistic details. The Israeli Orthopaedic Association. Tel-Aviv, 2006. Peskin B, Hous N, Levin D, Reis ND, Zinman C. Transphyseal osseous bridges in experimental osteonecrosis of the femoral head of the rat. Histologic study of bony bridges connecting the epiphyseal with the metaphyseal bony trabeculae through gaps in the physeal cartilage. The Israel Orthopedic Association, Annual Meeting, Tel-Aviv, Israel, December 2003. N. Hous, O. Haddo, O. Levy, 4 Part Fractures & Fracture-Dislocations of the Proximal Humerus. 21st Congress of the European Society for Surgery of the Shoulder and the Elbow (SECEC-ESSSE). Sep 2008. G. heffernan, O. levy, N. hous. Cost saving in arthroscopic shoulder surgery. Analysis of the influence of durgical techniques. BESS (British elbow and shoulder society) June 2009. G. heffernan, N. hous, O. levy. Audit of the accuracy and completeness of coding in shoulder surgery. The value of ongoing audit and feedback to the coding department. BESS (British elbow and shoulder society) June 2009. Ofer Levy, Shabnam Iyer, Noel Peter, Nir Hous, Dave Cash, Ali Narvani. Propionibacterium Acnes: An Underestimated aetiology in the pathogenesis of osteoarthritis? & cause for Late Postoperative post-arthroplasty joint pain, loosening and Infections? BESS (British elbow and shoulder society) march 2010. - Kessel prize for the best paper at BESS meeting. N. Hous, A. Narvani, R. Abraham, J. Relwani, T. Even, S. Copeland, O.Levy Stemless- Metaphseal Reversed Prostesis for Arthroplasty with Severe Cuff Deficiency: 2-4 years Results. International Conference on Orthopaedic Biomechanics, June 2010. Ofer Levy, Ehud Atoun, Ali Amir Narvani, Ruben Abraham, Nir Hous,, Tirtza Even, Jai Relwani, Stephen A. Copeland, Giuseppe Sforza, Alexander Van Tongel: Does Reverse Shoulder Needs A Stem? 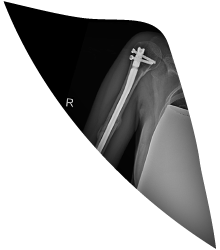 2-7 Years Follow Up With Stemless Reversed Total Shoulder Prosthesis: the 2012 Closed Meeting of the American Shoulder and Elbow Surgeons (ASES). Ofer Levy, Ehud Atoun, Ali Amir Narvani, Ruben Abraham, Nir Hous, Tirtza Even, Jai Relwani, Stephen A. Copeland, Giuseppe Sforza, Alexander Van Tongel: Does Reverse Shoulder Needs A Stem? 2-7 Years Follow Up With Stemless Reversed Total Shoulder Prosthesis:: 2013 Closed Meeting of the Shoulder and Elbow Surgeons (ASES). Ofer Levy, Ehud Atoun, Ali Amir Narvani, Ruben Abraham, Nir Hous, Tirtza Even, Jai Relwani, Stephen A. Copeland, Giuseppe Sforza: Does Reverse Shoulder Need a Stem? Two to Seven Years Follow Up with Stemless Reversed Shoulder Prosthesis. The 2013 AAOS Annual Meeting, Chicago, IL. Jacob Shapira, Shadi Saa’dia, Doron Norman, Nir Hous, Bezalel PeskinPreoperative Assessment of Knee Axes with Standard Anteroposterior Radiograph. 2013 ( The Israel Orthopedic Association, Annual Meeting, Tel-Aviv, Israel).